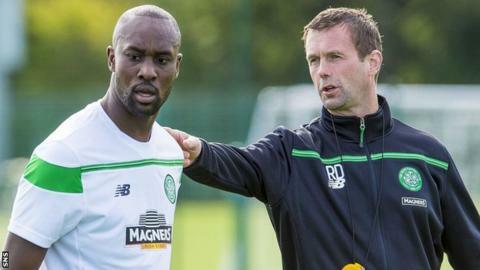 Carlton Cole would add a new dimension to Celtic's attack should he sign for the Scottish champions, according to first-team coach John Kennedy. The 31-year-old striker is a free agent after leaving West Ham United this summer and his representatives have held talks after a week on trial. "He is a different type to what we have," said Kennedy. "He's had a good career and he's obviously got a bit of presence about him." Turkish striker Nadir Ciftci, Celtic's summer signing from Dundee United, has failed to settle and found himself on the bench in recent weeks. And manager Ronny Deila is considering adding Cole, who has seven England caps and spent nine years with the Hammers, to his squad. "Carlton came in and trained well last week," said Kennedy. "You could see he is a little bit rusty and a little bit short in fitness, but the last I heard the manager and (chief executive) Peter Lawwell were speaking to his representatives. "There was no decision made this time and we'll see how things pan out this week, but he is a really terrific lad." Kennedy admits that it will be the Celtic defence who will face their toughest test of the season when they entertain Robin van Persie and his Fenerbahce team-mates on Thursday in Europa League Group A. "Ajax were a big test, but this is another top side," the former Celtic defender said of the 2-2 draw in Amsterdam. "It's going to be a tough one. Van Persie has been out the team in the past two weeks, but judging by the way he has come on and impacted the game, I'd be surprised if he doesn't play on Thursday. "They have great individual players, they are also a team that's in transition with a new coach and a lot of new players, but they are still a top side." Summer signing Jozo Simunovic is expected to recover from an ankle injury in time to play, but Kennedy said that Efe Ambrose has proven he has the quality to deputise in central defence. "The big positive is Efe has come in and done really well for us," he said of the Nigeria international who was sent off in Saturday's 0-0 draw with Hearts. "He's been patient. He has found himself out of the team when maybe he thought he might have had a chance, but he has trained well and he has certainly come in and done a great job for us in recent weeks."